Mostly bare root bushes (some in 2-3 litre pots). 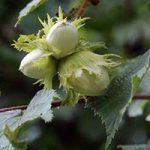 Hazelnuts mature in September, early varieties in early Sept, mid varieties in mid Sept, late varieties in late Sept.
Good hazelnut yields require cross pollination. 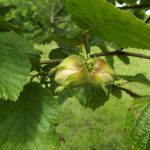 If you have native hazel hedges next to your planting site, then you’ll probably get good cross pollination from these, otherwise plant at least two varieties.